Yes, we saw that before. Recently in “The Wrestler” and “The Fighter”. Earlier in “Rocky”, or with a twist in Clint Eastwood’s boxer movie … whatsitcalledagain… . So often in-between. These films do follow a very tight scheme, they have to, I guess, the need to build an opportunity for the fighter, and how better to do that than by first throwing him / her down into the gutter, making the reach for the opportunity so much more existential? 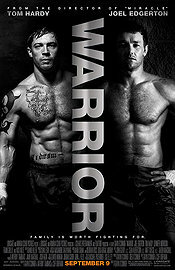 What’s the difference between “Warrior” and all the other films about the fighter who tries to do it one more time, to beat the odds, to reach the pantheon of his craft, to beat the living daylights out of his opponent? There is no fundamental difference, but it tries an aspect that was worth trying. Several differences, actually: Setting up two brothers against each other, and – as Roger Ebert in his review so correctly points out – not taking sides for either. Having these brothers played by major movie stars who both happen to occasionally be excellent actors. Using a sport that I at least have not yet seen featured in a major movie, Mixed Martial Arts. Having Nick Nolte around being grumpy and worn out is almost playing it by the book, seems you need to have the rough, lost father figure in that genre. Makes for great parts for the elderly movie stars, and of course Nolte can do this, he is made for this kind of role, conventional as it may be. “Warrior”, it turns out, is well worth seeing, especially for the scrip and directorial experiment of having two equal heroes, and for me personally in having the ferocious force of nature that is Tom Hardy on screen, who can be so subtle and feminine, but wait until he takes a breath, pumps up his chest and comes for you. One of my favourite actors at the moment, who does not seem to make wrong choices.